When I tell people I split my time between New York City and Fairbanks, Alaska, I’m often hit with a barrage of myth-busting questions. No, we don’t live in an igloo. No, it’s not dark 24 hours a day during the winter. (That’s Barrow). No, it’s not the town with the vampires. (Also Barrow). And yes, your grandmother’s Alaskan cruise trip most likely ended here. 1. 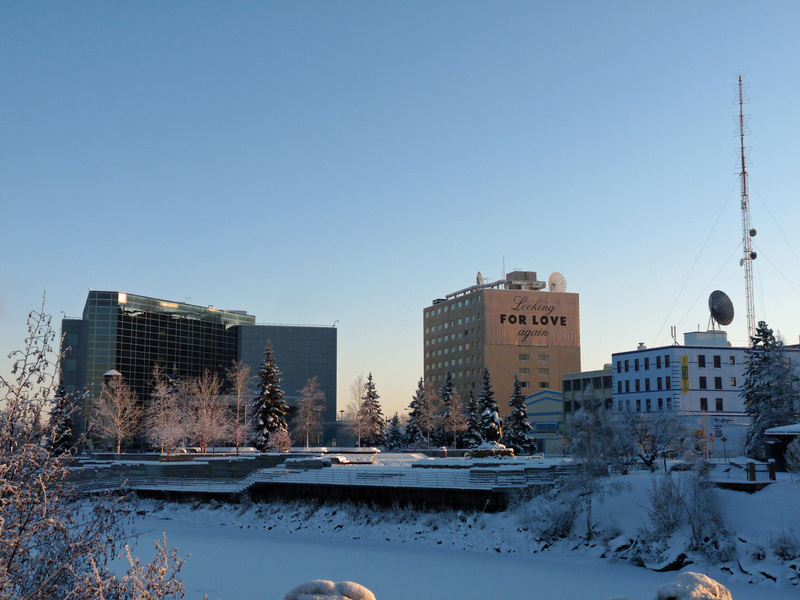 Downtown — This is where it all began, with a trading post on the banks of the Chena River. Today Downtown Fairbanks is an active and evolving mix of art galleries, coffee shops, restaurants and cute clothing and antiques stores. 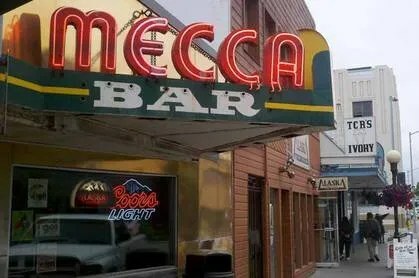 Be sure to visit The Mecca Bar, whose can’t-miss neon marquee made a cameo in the opening scenes of Sean Penn‘s film adaptation of Jon Krakauer‘s Into the Wild. 2. Public art — Downtown has a solid public art presence with wall murals, a newly completed steam pipe painting project and the remnants of Ted Fellow Candy Chang’s “Looking for Love Again” installation piece, which hangs from the top floor of an unoccupied former hotel. Additional public art pieces are scattered around town, including local sculptor Mark Fejes’ “Migration” piece, which welcomes you at Fairbanks International Airport and yarn bombing on the campus of The University of Alaska Fairbanks (UAF). 3. 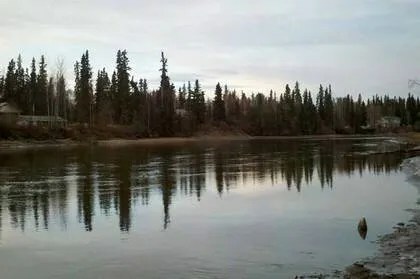 The Chena River — The Chena twists and turns all the way through town and beyond. In the summer, rent a kayak and enjoy a leisurely float. In the winter, the river’s thick cover of ice allows it to be a great location for events such as the Yukon Quest sled dog race. 4. The Iron Dog — Billed as “The World’s Longest, Toughest Snowmobile Race,” The Iron Dog not only finishes on the frozen Chena, it’s also your best bet for a Palin sighting in the interior. Todd P. is a four-time Iron Dog champ, and Sarah was there to cheer him on earlier this year. 5. Ice Road Truckers/Guy Fieri mash-up — You most likely won’t want to drive the entire length of the haul road like the Truckers do, but you should make the 10-mile trek to The Hilltop Truck Stop for some of their famous pie. Back in town, do a drive-by past the Carlile Trucking office and then head to the nearby Cookie Jar Restaurant for one of those gigantic cinnamon rolls eaten by Guy Fieri on the Food Network’s Diners, Drive-Ins and Dives. 6. Music — The Blue Loon, located just outside Fairbanks in Ester, has played host to everyone from Snoop Dogg and Taj Mahal to Flogging Molly and The Wailers. It’s also a great place to catch a first-run flick while noshing on pizza and beer. The Marlin is the fifth Beatle to the local music scene and a home to resident “cabin rap” faves The Phineas Gage and rising indie rockers Young Fangs. 7. Books — Gulliver’s has an extensive selection of locally themed and authored books and music. Forget-Me-Not has more than 40,000 used titles and benefits the Literacy Council of Alaska. The Comic Shop has a ton of fun graphic novels, in addition to toys, games and collectibles. And Fairbanks gets extra cool points for having a bookmobile that goes out to the more rural areas and also makes homebound deliveries. 8. North Pole — It’s not the North Pole, but Santa has a house there (on Saint Nicholas Drive) fronted by a ginormous 42-foot-tall, 900-pound Santa statue. They’ve been mailing letters from Santa since 1952. North Pole also is the hometown of NFL player Daryn Colledge, who was part of the Super Bowl XLV-winning Green Bay Packers. And, while he was stationed at nearby Eielson Air Force Base, “happy tree” painter Bob Ross lived in North Pole. 9. Arts associations and presenters — From the Fairbanks Concert Association, the Drama Association and the Symphony to the Summer Arts Festival, Well Street Art Company and the UAF Museum of the North, the city is surprisingly saturated with quality fine and performing arts offerings. 10. Eat local — Locally grown and made products are everywhere in Fairbanks. Meads at Gold Hill Liquor. Beer at Silver Gulch. Ice cream at Hot Licks. An abundance of vegetables, jellies and soaps at the summer farmer’s market. Produce and meat at Homegrown Market. 11. Winter — Northern lights! Plus, where else can you toss a mug of boiling water into the air and see it instantly vaporize? This entry was posted on December 12, 2012 by AK in alaska, Fairbanks and tagged alaska, Fairbanks, usatoday.